On Friday May 4, Patrick Cena, a local resident, spotted an injured green sea turtle washing ashore in Christmas Cove. According to Erica Palmer, a Coral World veterinary technician, who is also a sea turtle assistance and rescue responder, “Patrick contacted Coral World for assistance. He then transported Matt Tartaglio, Coral World assistant curator, and me on his boat to Christmas Cove to see what we could do for the turtle.” Apparently, the same injured turtle had been spotted on May 1 swimming in shallow waters off Little St. James, but the turtle spooked when the individual who tried to come to the turtle’s aid entered the water. Cena made the next sighting three days later. Palmer said, “When we found the turtle it was extremely weak, lethargic and had no use of its rear flippers. We took it back to Coral World where we administered emergency medications to combat anemia and infection because of a large fracture of its carapace and associated blood loss. We think the turtle had been injured close to a week earlier because there was dying bone and soft tissues involved.” The staff monitored the turtle 24 hours a day for the first 48 hours. “We provided supportive care and medications during the weekend while we lined up a CT scan with Dr. Jeffrey Guller at St. Thomas Radiology for Monday to assess the extent of the damage. A veterinary radiologist in the states informed us that the scan revealed a severed spinal cord and massive inflammation, as well as several missing vertebrae,” said Palmer. The most likely cause of the injuries was blunt-force trauma by a boat strike. “We hate to lose a turtle, but the long-term prognosis for survival was so poor in this case because of the severity of the injuries, we made the difficult decision, in consultation with our consulting veterinarian, to humanely euthanize the turtle,” she said. 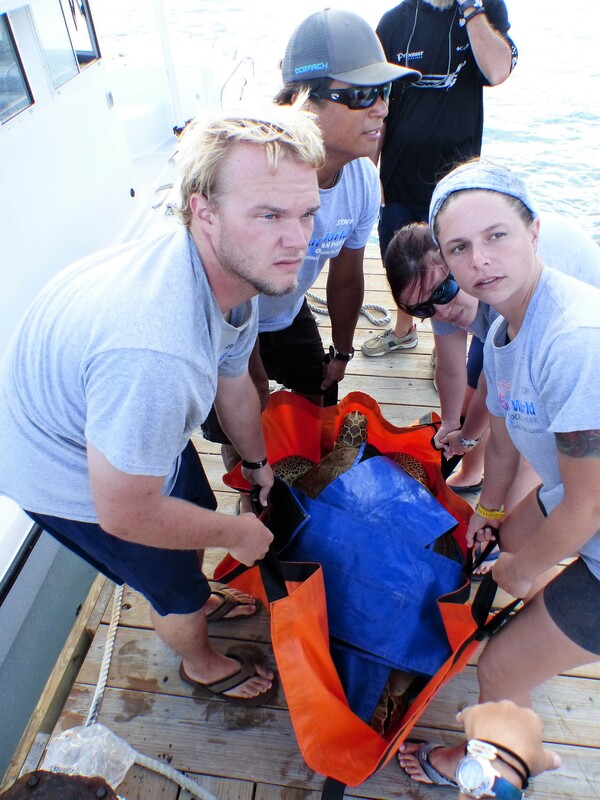 According to Palmer, who has seen many injured turtles during her work as a STAR responder, blunt-force trauma from boat impact or propellers are a significant threat to sea turtles and other marine animals. All sea turtles are designated as either threatened or endangered under the U.S. Endangered Species Act of 1973. Violations can result in up to one year in prison, up to a $100,000 fine, and the confiscation of any equipment used during the criminal act. Coral World is the only approved Sea Turtle Rehabilitation Facility in the Virgin Islands. It has been conducting and funding turtle rehabilitation since it reopened in 1997 as part of its mission to educate, entertain and inspire appreciation for the Caribbean marine environment.